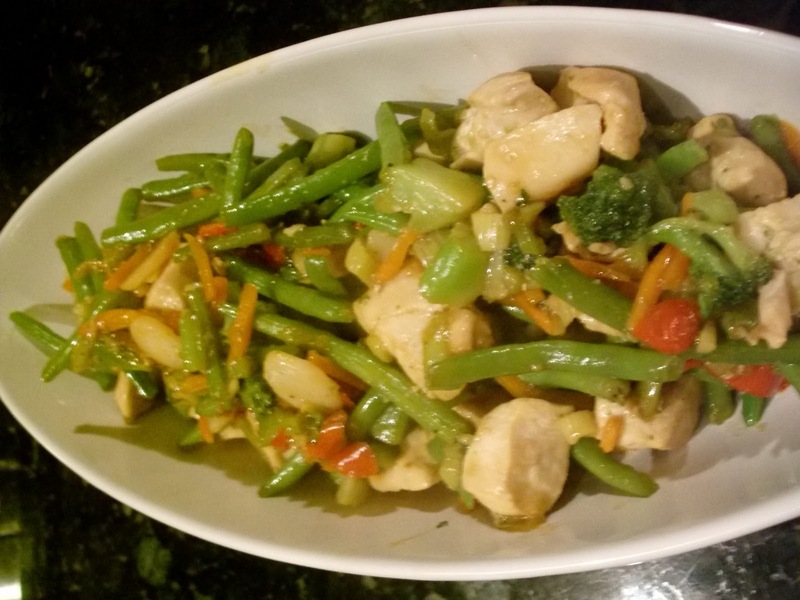 Deelicious Sweets: Sweet-and-Sour Chicken with Lots of Vegetables! 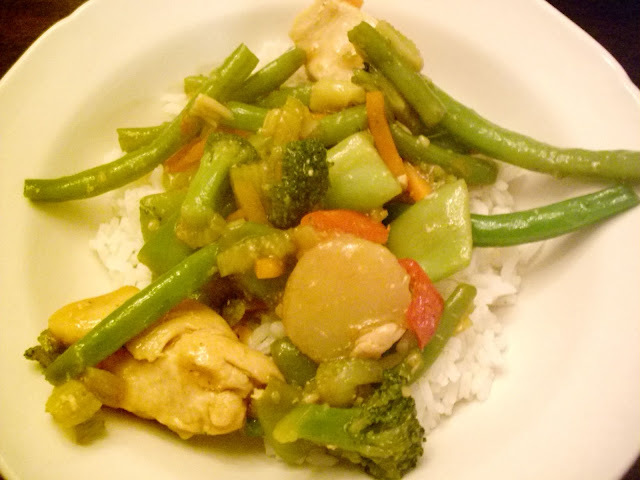 Sweet-and-Sour Chicken with Lots of Vegetables! I would really like to expand my knowledge and cooking abilities to include Asian foods. I'm sure, in fact, I'm positive that this recipe I am making up for dinner tonight is completely and totally Americanized. Don't get me wrong, that's not a bad thing. I'm just looking to expand beyond Americanized Asian dishes. That's my 2011 project to tackle. 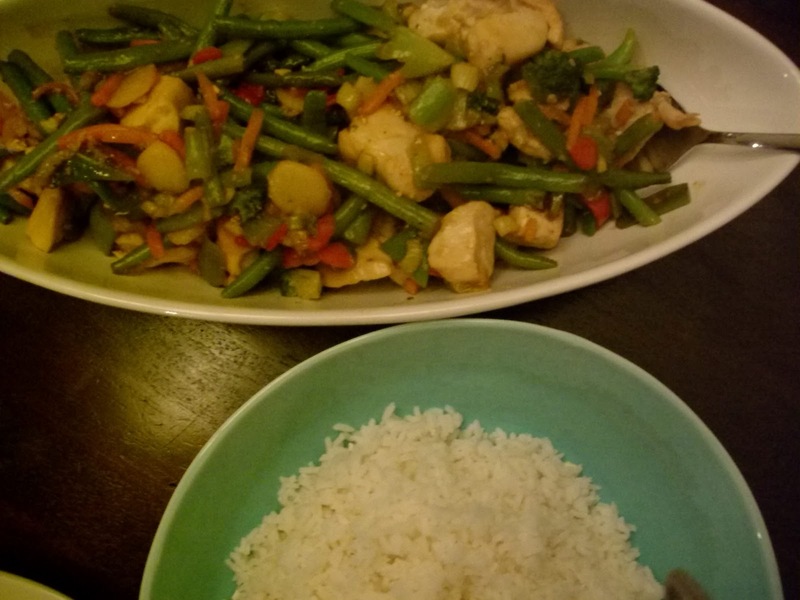 For now, I give you the Americanized version of sweet-and sour chicken. Besides, I'll take the lesser calories and the advantage of not having to leave the house for this dish any day! Cook rice according to package instructions. Meanwhile, in a small bowl or measuring cup, whisk together cornstarch, sugar, soy sauce, and vinegar. Set aside. In a large skillet or wok, heat oil over high. 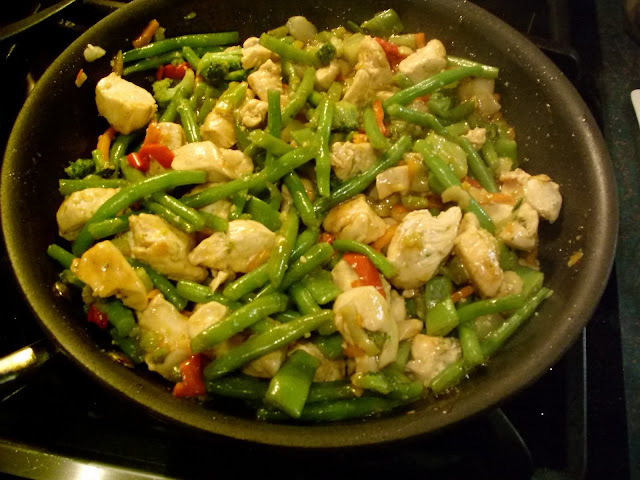 Add chicken, green beans and frozen stir fry vegetables, and chopped celery and cook, stirring frequently, until vegetables begin to soften, about 5 minutes. 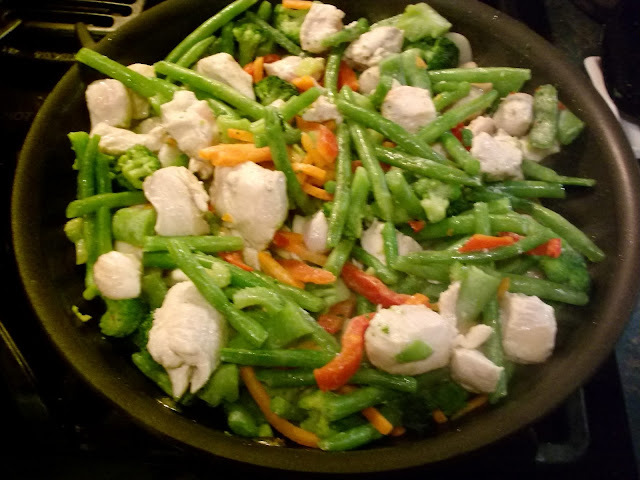 Add ginger, and garlic and cook, stirring frequently, until chicken is cooked through and vegetables are tender, about 4 minutes. Whisk soy sauce mixture, add to skillet, and cook, stirring constantly, until sauce thickens, about 3 minutes. Remove from heat. Fluff rice with a fork. To serve, spoon chicken mixture over rice and top with peanuts if desired. This sweet and sour sauce was da bomb! I'm gonna make some up for my cereal in the morning, maybe put some in my coffee! Awesome! I have to make this sooooonnn! !